Green Lighting Solutions is a market leader in the supply of LED lighting. LED lighting is a fast-growing market, thanks to its ability to deliver significant energy savings for home owners and businesses, without the performance drawbacks of fluorescent energy-saving lights. Our brief was to create a new website that would showcase the 3500+ product range of Green Lighting. 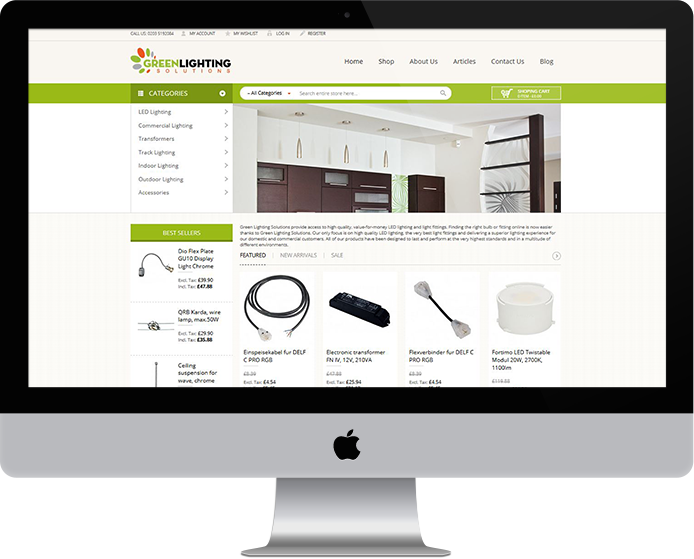 In addition, we needed to ensure the website contained an e-commerce mechanism that was user-friendly and easy to navigate, so customers could easily buy lighting solutions online. One of the key tasks of the new website was to keep a catalogue of more than 3500 products up to date, including current prices and descriptions. We decided to deliver this requirement through the use of scripts which could import product pictures, descriptions and prices straight from the manufacturers to the website. It was also important to create a user-friendly buying experience, meaning the front-end e-commerce site needed to be backed up with a system that could manage orders, products and categories. We delivered a full management function that seamlessly integrated with the e-commerce module, allowing Green Lighting staff to effectively manage all orders created via the website. Lastly, it was also vital that the website attracted new customers to Green Lighting. We integrated a keyword-optimised blog and a new social media presence, which we manage on an ongoing basis alongside the website. The resulting website is an attractive and user-friendly e-commerce platform, which has attracted new customers and delivered real return on investment for Green Lighting Solutions. Management of integrated social media presence.